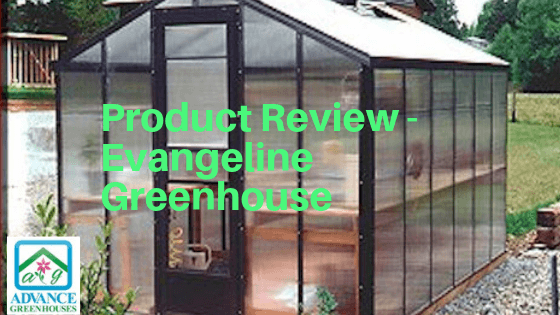 Today we will be doing a product review of one of the greenhouse kits that we offer for sale – The Evangeline Greenhouse. We have been selling this kit since 2002 and installed quite a few of them before we stopped offering installation. This is a quality built greenhouse that is available in either a freestanding or a lean to style. We are also able to do a gable end attached with this model. The heavy duty aluminum extrusions are 6063-T5 or T6 and the sheets or plates are 209. Due to the extra strength of the aluminum you are able to hang a 50 pound hanging basket off each purlin. Our standard models are rated at 32 psf snow load and 85 mph wind loads. We are even able to supply stamped engineering with the stated loads. If you are in an area with a higher load requirement we can meet up to 100 psf snow load and 140 mph wind load. That’s a heavy duty frame! And it is backed up with our excellent warranty. If any part is found defective in manufacturing for the first year it will be replaced free of charge to you, we even pay the shipping. 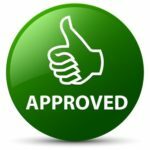 After the first year up to the lifetime of the greenhouse we will send you the part for free, but we will ask you to pay the shipping. Our standard colors are white, brown and green. Most people find that one of these matches their house nicely. But, some chose to custom match the color of their greenhouse to the color of their home. I have even had some sports fans make their greenhouse their teams color. This can be done by simply providing us with a color number from a major paint manufacturer. We are able to custom match to their color. So, the sky is the limit. Yeah, blue is easy. The glazing is available as 6mm twinwall polycarbonate or 5 wall 16mm polycarbonate. We are not able to offer the 16mm in the curved style, but the twinwall polycarbonate is available in either curved or straight eave. This quality polycarbonate has a ten year warranty that it will not lose more than 6% in light transmission. That’s just a fancy way of saying it won’t get brittle or yellow. The actual lifetime expectancy for the sheets is between 15 – 20 years. The sheets also have a 10 year warranty against hail damage. There is only one negative in my opinion regarding polycarbonate. Actually, it is not a negative for me, but I hear a lot of people with these concerns. You cannot see clear through the sheets like looking through a piece of glass or a window. There are ribs running between the exterior clear sheets and they will break up your view. You will be able to see colors, but not forms through the panels. If you feel like you need a clear view I would recommend our Acadian greenhouse line. Actually, it is a “sister” greenhouse to the Evangeline. It is made with the same framing materials. 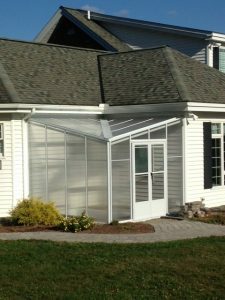 This greenhouse is available in a curved eave or straight eave as previously mentioned. 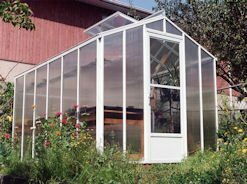 It is available as a freestanding greenhouse, or as a lean to greenhouse. We can do a standard lean to with a shed type roof, or we can build a gable end attached greenhouse with a gable style roof. These greenhouses come with the pre cut frame, the pre cut polycarbonate panels, the appropriate number of roof vents and one door. The roof vents are oversized at 20″ x 48″ and they always come with a solar powered opener. These openers require no electricity. They have a wax cylinder that works on contraction and expansion. When the wax gets hot it expands pushing the vent open. When the was cools it contracts and pulls the vent shut. 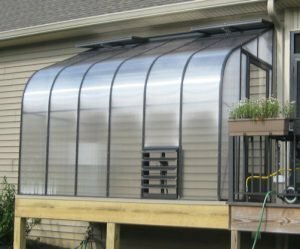 There are so many customizations for this greenhouse it is hard to list them all. With lean to greenhouses many people have the issue of their roof being too low for the greenhouse to attach. We are able to accommodate this need in two different ways. We can do a lower roof pitch on the greenhouse, thus giving it a lower attaching height. Or, we can build it so that it attaches to your soffit of your home. This is a common problem for people with ranch style homes or people who want a large projection (the measurement going away from your home). We can customize the width of the greenhouse, the length of the greenhouse, the sidewall height, the door size and what type of door. We have custom Victorian trim for the ridge. Optional ventilation items include side vents with solar powered openers and motorized exhaust systems. We are also able to add a second door. We can upgrade the standard combination storm door to a commercial storefront door. We can do custom jogs to get around obstacles that would be in the way during installation. We can even do an inverted roof (this is a really expensive customization, but we can do it!). We are able to adjust the door in the greenhouse to accommodate your site built knee wall. This is even a free option. No charge, just let us know how many inches high you are going to build your wall. We will supply you with a foundation sketch once an order has been made. 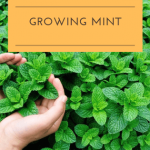 This will enable you to go ahead and get your site work done before the greenhouse arrives. This greenhouse will come Common Carrier. Everything is securely shipped in wood containers. We suggest 2 people for unloading. Turnaround time is dependent on the current workload, but is usually 4 – 6 weeks depending on the time of year. This exceptional quality greenhouse is a great investment for anyone, even if you don’t need all of the customizations. It is quality right down to the components used for manufacturing. This is truly a once in a lifetime greenhouse that will last for years and years to come. I personally give this greenhouse 2 thumbs up.